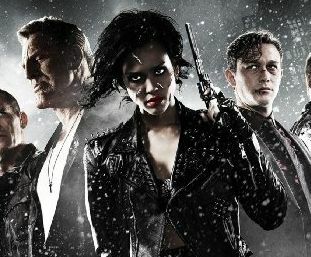 Dimension Films is presenting exclusive footage from the upcoming Frank Miller’s Sin City: A Dame to Kill For at the San Diego Comic-Con at 2:50 p.m. Pacific Time today. Fans will get to experience the Sin City universe and take part in a special discussion with Robert Rodriguez, Frank Miller and the cast. ComingSoon.net: Welcome to our live blog of the San Diego Comic-Con panel for Frank Miller’s Sin City: A Dame to Kill For. The panel should be starting soon, so stay tuned. ComingSoon.net: Yep, just waiting for the panel to start. ComingSoon.net: Sorry guys, writers coming online now. Panel is underway. Joshua Starnes: Frank looking like a scarecrow up there, quite different from the last time he was here. Silas Lesnick: Sorry, Josh is having some technical difficulties. Jumping on now! Joshua Starnes: Stacy Keach!! Christopher Lloyd!! any comment about the new segment creadted exclusively for the sequel? Joshua Starnes: I think at this point Alba has done more Rodriguez movies than Salma Hayek – she’s the new muse. Did bruce willis survive the previous film? Joshua Starnes: Has it really been a decade since the first Sin City? Joshua Starnes: I am old. Silas Lesnick: “So you really phoned in the score?” Miller kids. Silas Lesnick: Apparently it’s a childhood friend of his brother’s. Silas Lesnick: Brolin says he feels like a fraud because he was able to just show up and act when most of his co-stars went seriously in-depth for their roles. Silas Lesnick: Miller says that the lack of connection actually increased the energy between actors. Silas Lesnick: Rourke would play Johnny Cash’s cover of “Hurt” over and over during production on the first film to get into the character of Marv. Silas Lesnick: Miller names a scene from the first film between Clive Owen and Dawson that he feels is particularly strong — a kiss in the rain. Silas Lesnick: “Will there be more SIN CITY graphic novels?” a fan asks. Silas Lesnick: “Inevitably,” says Miller. He says he has a stack of stories he wants to do. He’s not sure when he’ll get to them, though. Silas Lesnick: Another fan wants a Martha Washington movie! Anyone ask what happened to Clive Owen/if he’ll appear in the last act? Silas Lesnick: Brolin is playing the same character as Owen did. As in the comics, he gets plastic surgery between the stories. Silas Lesnick: They’re about to show something. Be right back! Silas Lesnick: They just showed an extended trailer set to Nicki Minaj’s “Babes,” which is one of the songs Nancy dances to in the new film. Silas Lesnick: The Nancy story appears to be the new one and is set after the events of the first film. Silas Lesnick: Willis looks like he appears as a ghost, but interacts with Nancy, asking her not to avenge him. Silas Lesnick: Thanks for reading everyone!